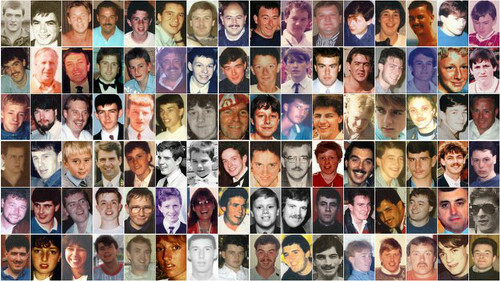 The Hillsborough inquests today began to hear pathology evidence about each of the 96 victims of the disaster. 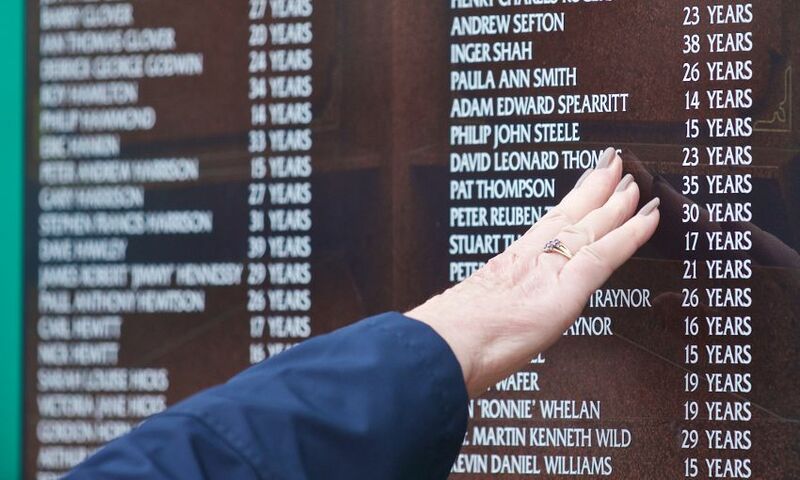 The hearings, in Birchwood Park, Warrington, entered their final phase of evidence as medical experts were asked about each of the Liverpool fans who died in the disaster on April 15, 1989. The pathologists and intensive care experts began to give their opinions on the time of death and cause of death during this phase, which is expected to last until the Christmas break. The court heard evidence about Marian McCabe, a 21-year-old from Essex who travelled to the game with friends including mum-of two Inger Shah, 38. Photos showed Marian crushed against the perimeter fence of the pen from about 3.02pm, minutes after the match kicked off at 3pm. The court heard Marian was carried onto the pitch after 3.17pm but there was no formal assessment of her for vital signs. He said it was “most likely” that Marian did not have a heartbeat and was not breathing by the time she was carried onto the pitch. Professor Guy Rutty, a pathologist, told the court he thought Marian died some time between 3.04pm - when a witness described seeing her turn blue - and 4.09pm, when she was confirmed dead in the gymnasium. Dr Nat Cary, also a pathologist, said they didn’t have the data to know any more than that she was unconscious when photos of her were taken at the front of the pen. The court also heard about Christine Jones, a 27-year-old radiographer from Preston who had gone to the match with her husband Stephen Jones. The couple became separated in the pen at about kick-off. Medical expert Dr Jasmeet Soar said it was most likely that Christine did not have a heartbeat when her husband, also a radiographer, saw her on the pitch and checked her for vital signs. He said he believed she died between 3pm - when she was moved away from her husband in the crowd - and 3.35pm - when she was carried across the pitch to the gymnasium on a hoarding. Pathologist Dr Cary said he was not able to narrow the timeframe for her death from between 3pm and 4.15pm - when Christine was confirmed dead by a doctor - because of a lack of evidence. During evidence about Anthony Kelly, 29, from Rock Ferry, the court was shown footage of him lying unattended on the pitch for two minutes from 3.31pm. Prof Nolan said Anthony was at least unconscious when he was placed on the pitch, but he could not be certain whether he was in cardiorespiratory arrest - with no breathing or heartbeat. Prof Nolan said: “If Anthony was placed on the pitch and at that stage was breathing and did have a pulse, the sheer fact he’s unconscious and lying on his back would make it highly likely that his airway would become blocked. Dr Cary said he believed Anthony died at some point between 3pm and 4.01pm, when he was confirmed dead. The experts said 15-year-old Peter Harrison, from Page Moss, appeared to be conscious in a photo showing him in the pen at 3.03pm. Prof Nolan said: “Looking at that image, my thought was that, because of the position of Peter’s head, if anything, slightly looking upright, it doesn’t appear to be supported by surrounding people, so it’s on his own. He said it was possible Peter could be moving after having been pushed by the crowd but he was not able to tell from one still image. Footage showed the teenager being carried onto the pitch at 3.26pm. He was also shown lying unattended for a period of time from 3.27pm. Dr Soar said his left leg appeared to be internally rotated as he lay on the pitch, which he thought was because his left thigh bone had been fractured. Dr Cary said the fracture was confirmed in the post-mortem report but there was not enough detail on the injury to suggest whether it happened before or after Peter had died. At 3.29pm Peter was placed on a hoarding and carried to the gymnasium, where he was confirmed dead at 4pm. The court heard Peter died sometime between 2.56pm and 4pm, although Prof Rutty said a timescale of between 3.03pm and 4pm may be considered by the jury after considering the photo of Peter apparently alive in the pen. The pathologists recorded that all four of the victims had died from compression asphyxia - a uniform term used to describe various mechanisms which led to death as a result of the crush.